Ok, so we are all adults here. We all know perfectly well that these are NOT the best wings in the city. In the city that never sleeps, and never runs out of wings, there are hundreds of wings out there, not counting the simple bar wings you can find in every corner. But I’m just one Ziggy, with different taste sensitivities than many readers, and I cant taste them all. “Decent wings” or “favorite wings” doesnt sound as convincing, or Google friendly. With that said, there’s only one certainty: The competition is rather fierce. And any new joint offering wings has to be creative, and deliver something more than palatable. Distilled – Distilled Wings. A former Momofuku alumni has been quietly dishing out great wings in Tribeca. Distilled may be better known for their mixologist team as of late, but those wings have been on the menu since day one. These are grade A quality hefty wings. They are double fried to crispy perfection, and coated with a thick and messy layer of Gochujang (that fermented Korean sauce you put on your Bibimbap). And they serve it with their own version of not too funky blue cheese dressing to cool things down. Truly excellent wings. 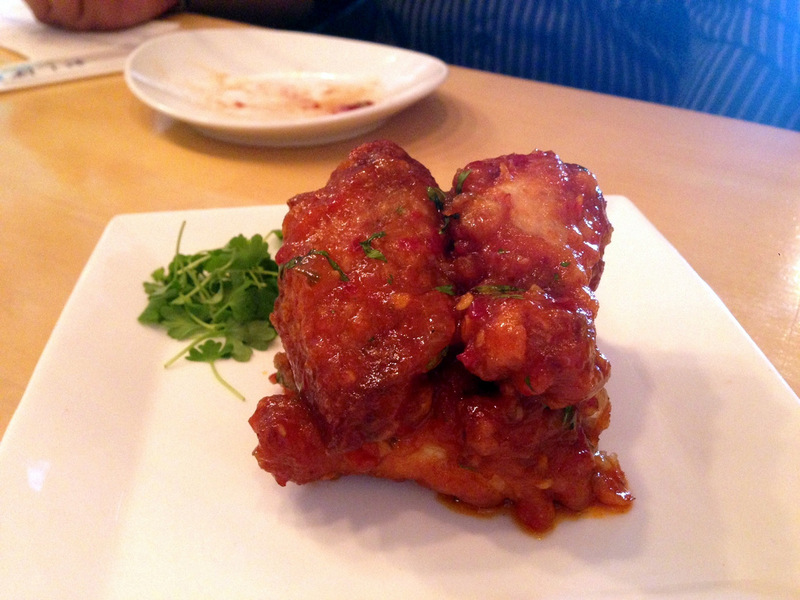 Danji – Spicy ‘k.f.c.’ Korean Fire Chicken Wings. Love at first sweat, around four years ago. I like to bring visitors here on occasion, though I don’t love when they witness me lick my own fingers which may be considered rude. What’s more rude me thinks is wiping off that awesomeness with wet napkins. Heat level has been steady all these years, so make sure to have the fantastic tofu before altering your palate. This is pure delicious heat, as opposed to senseless. Biang! – Chicken Wings Skewers. This dish prompted me to bump up this post. In fact it was as soon as I finished my wing, and right before trying to convince my daughters that its way too spicy and there’s more food coming. It didnt work, as they gobbled those things in full force. One can easily overlook them because Biang! is known for just about everything else but wings, but dont make the mistake. Like Pok Pok below these are full high quality wings, and oh so nicely seasoned to absolute perfection. And while you at it, also try the Cauliflower skewers. Yes, not a typo. Cauliflower! Jun-Men Ramen – Chicken Wings. A must order for me on each visit since discovery. 4 plain looking wings, but far from plain tasting. They are double fried to give them a nice crisp, but retain plenty of juice and strong peppery notes from the secret Jun-Men sauce. Even without the wings this is one Chelsea favorite. 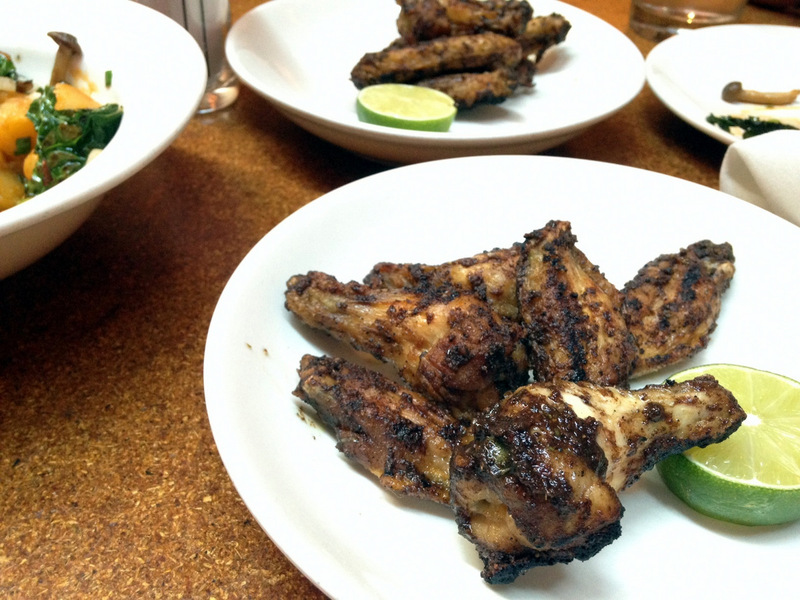 Pok Pok – Ike’s Vietnamese Fish Sauce Wings. Unlike the other wings here, wing historians out there are probably already well too familiar with this legendary pick. Articles, cookbooks, essays, children books (Goodnight Pok Pok Ike’s Vietnamese Fish Sauce Wings!) written about these wings. Somewhat inaccessible to most people so you wont find any tourists or Staten Islanders here normally. 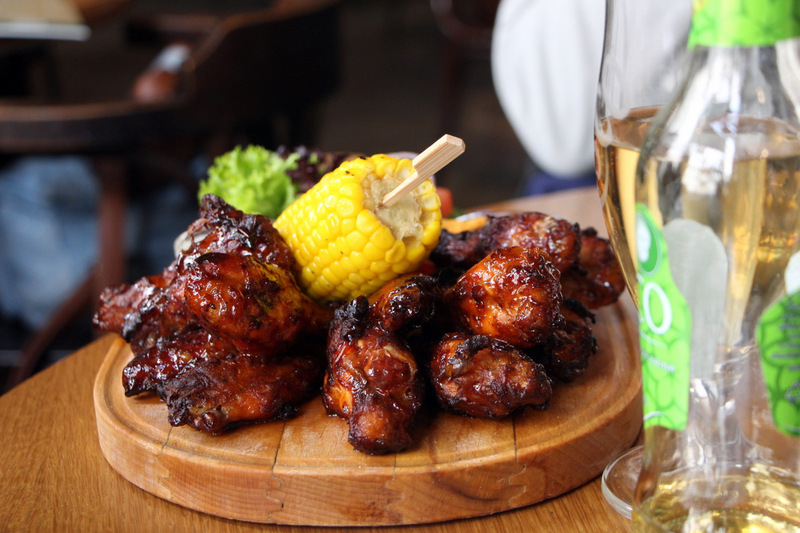 You can have the wings at the Whisky Soda Lounge next door while you wait for your table. The wings are huge, spicy, garlicky, on the dry side, but flavor packed. Put this one on your bucket list. Before the Great Wall of China, after Story Time with Bill Cosby. Bar Goto – Miso Wings. Black Sesame, Scallions, House Spicy Miso Sauce. 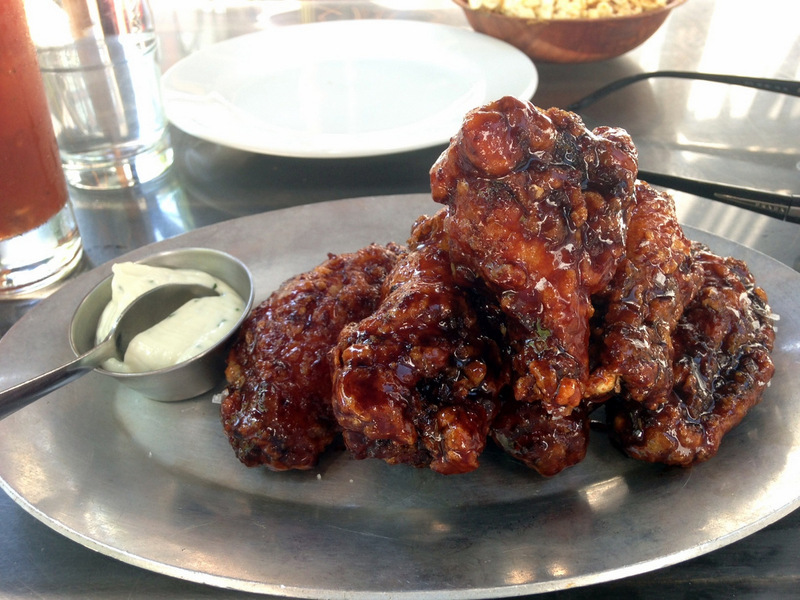 These are some of the best bar wings you will find in NYC. But in this semi-classy tiny Japanese cocktail joint, they will test your high-toned manners. You may find yourself sitting at the bar, talking politics with the bartender, while in desperate need of extra napkins to wipe the Miso glaze around your lips and sponge your sweaty forehead (these are hot!). And while the bartender exclaims his views on Trump, all you can think about is “Is it Miso, or is it Buffalo”. And once you think you got your classiness under control, you cant help but lick your fingers. All of them. Slowly. Han Dynasty – Dry Pepper Chicken Wings. 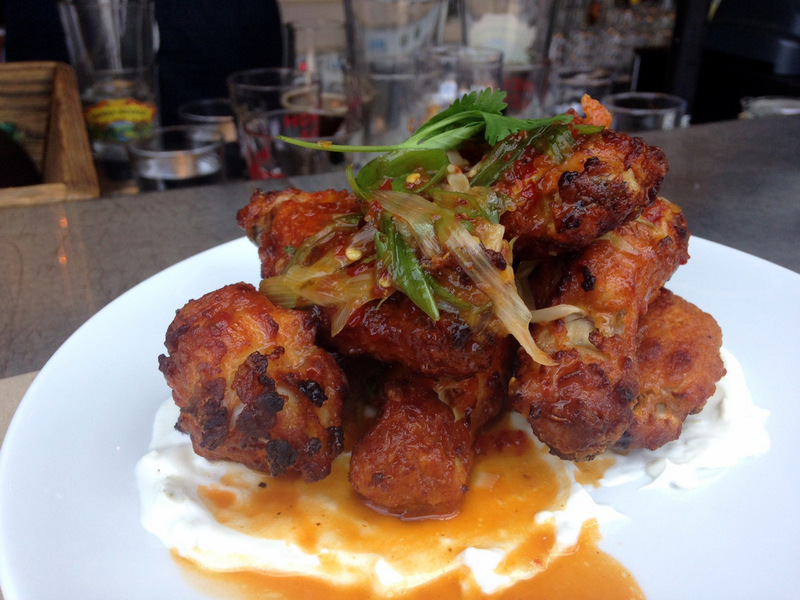 For a white, spicy lover like myself, these are what the Mission Chinese Food wings should taste like. They are marinated in sherry, cayenne, garlic, white pepper, and ginger. And stir-fried with a hefty dose of chili paste, chili peppers, garlic and scallions. They are more subdued than Mission’s, but not without its share of nice pleasant heat. Some of the pepper action bunched together into something reminiscent of a Yemeni S’chug (hot pepper spread). The skin is as crispy and delicious as it comes, which made me wish for more flesh to balance. Wonderful stuff!